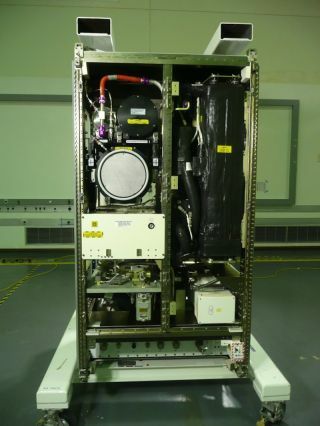 The International Space Station's Air Revitalization System represents the state of the art in spacecraft oxygen recovery technology. When humans leave Earth to explore planets like Mars and other hostile environments in outer space, they'll need to supply their own breathable oxygen. But as Michael Gazarik, associate administrator of NASA's Space Technology Mission Directorate, says, "You just can't bring all the air with you." NASA already has systems in place on the International Space Station to recycle around 40 percent of the astronauts' air supply, Gazarik said, but NASA is looking for new technology that can increase the oxygen recovery rate to at least 75 percent. NASA doesn't just want to improve its oxygen recovery rate. The new technology must also be lighter or take up less space and reduce power consumption, compared with the current air-making system, space agency officials said. NASA officials say they expect to give out about six Phase I awards — up to $750,000 each — for teams who submit winning proposals for the design, development and testing of a technology that's capable of an oxygen recovery rate of at least 75 percent. Then under a two-year Phase II contract, the selected teams then will build an actual prototype. NASA is also exploring the possibility of creating oxygen from other substances through a process called in-situ resource utilization (ISRU). The space agency's next Mars rover is slated to launch in 2020. That spacecraft will be carrying a technology experiment that will turn carbon dioxide from the planet's atmosphere into breathable oxygen, Gazarik noted. He said his office sees this experiment as "the first step" in testing whether space resource utilization schemes will work on a remote planetary surface. Advanced life support is just one of eight key areas the Space Technology Mission Directorate is investing in over the next 18 months, Gazarik said. Other fields of focus include high-power solar electric propulsion; advanced materials to make lighter fuel tanks and rocket structures; and deep-space communications systems that use lasers to beam messages across astronomical distances.